This bed and breakfast is located in a historic hill neighborhood in a Victorian home built in 1855. Downtown Newport and its many shops and restaurants are only a few blocks away. Rooms at the Serenity Inn Newport are inspired by European furnishings. All rooms have an en suite bathroom. The 450-acre Norman Bird Sanctuary, with 7 miles of hiking trails, is 10 minutes from the Serenity Inn Newport. Newport State Airport is just over 5 minutes away and Newport's city centre is within 4 minutes drive. When you stay at Motel 6 Newport, RI in Newport, you'll be near the airport, within a 15-minute drive of Easton's Beach and Newport Mansions. This motel is 3.9 mi (6.3 km) from The Breakers and 14.8 mi (23.8 km) from Narragansett Beach. 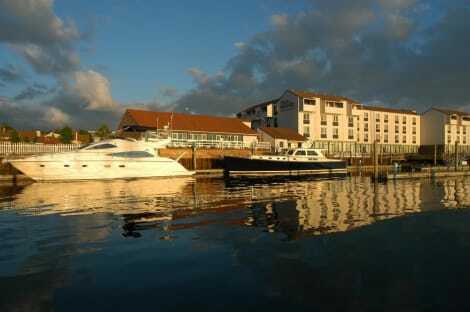 With a stay at Hotel Viking in Newport, you'll be in the historical district, within a 10-minute walk of International Tennis Hall of Fame and Museum and Bannister's Wharf. This 4-star hotel is 0.5 mi (0.9 km) from Kingscote Newport Mansion and 1 mi (1.6 km) from Easton's Beach. Centrally located in the charming town of Newport, Rhode Island, this bed and breakfast offers elegant accommodations, beautiful on-site gardens and is within walking distance to the harbor and beaches. Guests staying at the Town & Tide Inn will find easy access to many of the area's most popular points of interest. Historic Colonial homes and mansions, quaint local restaurants and the scenic waterfront are all only a short distance away. Guests can also enjoy a daily gourmet breakfast served in the dining room or in the seasonal garden. Take advantage of the bed & breakfast's room service (during limited hours). Wrap up your day with a drink at the bar/lounge. A complimentary full breakfast is served daily from 8 AM to 10 AM. Make yourself at home in one of the 133 air-conditioned rooms featuring flat-screen televisions. Your room comes with a pillowtop bed. Dial-up Internet access (surcharge) keeps you connected, and cable programming is available for your entertainment. Private bathrooms with shower/tub combinations feature complimentary toiletries and hair dryers. Featured amenities include complimentary wired Internet access, a 24-hour business center, and limo/town car service. Planning an event in Newport? This hotel has 1580 square feet (147 square meters) of space consisting of a conference center and a meeting room. Guests may use a train station pick-up service for a surcharge, and free valet parking is available onsite. lastminute.com has a fantastic range of hotels in Newport, with everything from cheap hotels to luxurious five star accommodation available. We like to live up to our last minute name so remember you can book any one of our excellent Newport hotels up until midnight and stay the same night.